The Black Bear is one of America's most magnificent creatures. The Black Bear's cunning and strength reminds us to respect the power of nature. Black Bear (Ursus Americanus) exclusively belong to the continent of North America. This powerful, yet charming creature is the smallest of the continent’s three bear species, but by far the most common. Black bears usually don't travel very far. A female bear will often have a range of 2-6 miles, while a male's range may extend over a much larger area (up to 15 miles), and overlap the ranges of several females. Despite their tendency to stay in one area, black bear excursions of up to 126 miles have been recorded. their claws to mark dominance of an area. Black bears are extremely agile, running at speeds of up to 35 miles per hour. Adult black bears stand 3 feet high on all four paws, but can range from 5 to 7 feet high when standing on two legs. Black bears are most active shortly before sunrise and after sunset. Black bears once ranged over most forested regions of North America. With human settlement, their current range is now restricted to relatively undisturbed, heavily forested areas. Black bears are cautious animals and typically not aggressive towards human beings. However, if they become habituated to human food sources, they may lose their fear of people. Black bears typically live 20-35 years if they are not killed by human related causes. 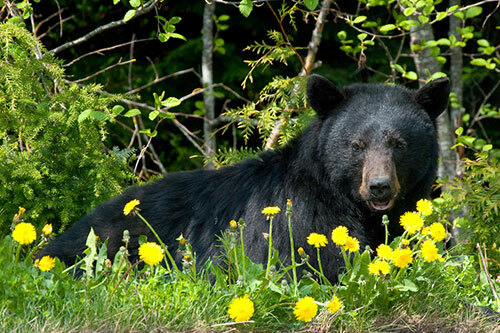 Around 75% of a black bears diet is vegetation. The remainder comes from bird eggs, fish, small mammals and carrion. They do not go after large prey very often. Black bears are very adaptable and eat whatever is in season and plentiful. In the summer, black bears love to eat fruits such as wild cherries, blueberries, raspberries, blackberries, and other brambles. In the fall, they like to eat acorns and nuts. 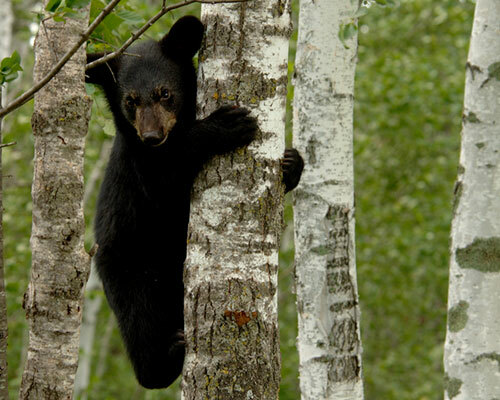 Black Bears love to eat honey, and will gnaw through trees to reach beehives set deep inside of the trunk. 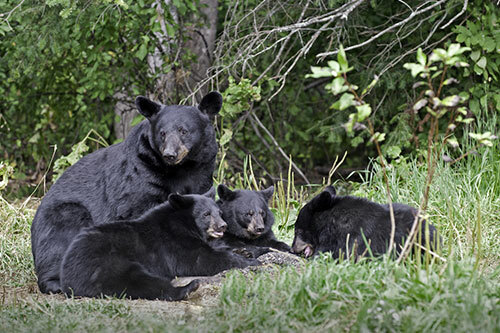 Black bears are not true hibernators, and may remain active all year long. They will enter a state of dormancy in the winter called torpor. While in dormancy their heart rate, respiratory rate and body temperature will drop. On warm days, they may leave their shelter to find food. Black bears do not usually urinate or defecate while in dormancy. Urine will be reabsorbed by their kidneys, and they will live off their body fat. 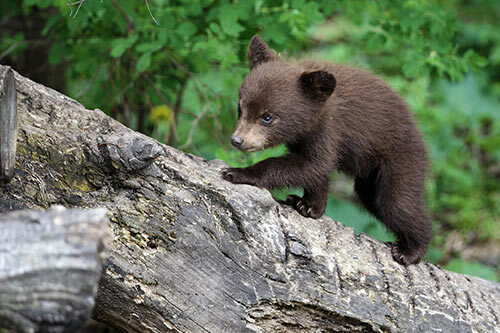 A black bear may lose up to 30 percent of their weight during torpor. Black bears can see in color, and have sharp vision close-up. Black bears have an excellent sense of hearing. A black bear’s ears will develop to full size faster than the rest of their body, and their hearing is estimated to be twice as sensitive as that of a human being. Black bears have an acute sense of smell, with a nasal mucosa area 100 times larger than that of humans.